Starring: Denzel Washington, Delroy Lindo, Albert Hall, Angela Bassett, Al Freeman Jr.
Twenty years later and it is quite clear that Malcolm X is one of the great masterpieces in the career of Spike Lee, a crowning achievement in an endlessly intriguing career of risks alongside a consistency in filmmaking. Both style and substance in a Spike Lee film are often recognizable to the director, and none established this better than Malcolm X.
Spike Lee burst onto the scene with a great deal of attention when he made the explosive independent film, Do the Right Thing (1989), which went on to achieve two Oscar nominations. He carried on with films about racial and social issues with Jungle Fever and Mo’ Better Blues, which were both modestly budgeted films. He was an independent film director and didn’t rely on large scale filmmaking for his type of storytelling, but this would all change with Malcolm X. The budget ran over, the running time was far beyond what studio heads wanted, and Lee ended up turning to celebrities such as Oprah, Michael Jordan and Bill Cosby to obtain finances for finishing the film the way he envisioned it. When he completed the epic masterpiece, it was well over three hours long. Even at 201 minutes, however, Malcolm X was a rousing success both critically and commercially, going on to two Academy Award nominations among many others. One of these nominations went to Denzel Washington for Best Actor in the title role. There are a number of talented actors in Malcolm X, but there is no denying the impact of Washington’s performance. He practically bursts off of the screen with energy and intensity. The year that Lee had last been awarded two Academy Award nominations was also the year that Washington won his first. After winning Best Supporting Actor for his unforgettable role in Glory (1989), and having already played Malcolm X off-Broadway, Washington seemed an obvious choice. Now it is nearly impossible to imagine anyone else in the role. 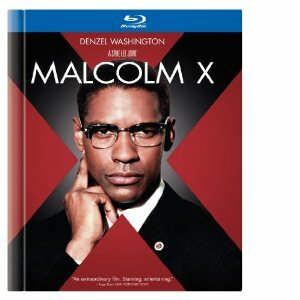 In celebration of Black history month and the twentieth anniversary of its release, Malcolm X is available for the first time on high definition Blu-ray in a special collector’s book. Along with 40 pages of photos, bios, production notes and trivia; this special collection also includes the Oscar-nominated 1972 feature-length documentary, Malcolm X, on DVD. Each of the discs is contained in the inside cover of the book. The Blu-ray disc also has some special features. There aren’t tons, but what is included is all rather significant. There is a making-of featurette which goes through the struggles of completing this film with the filmmaker’s integrity intact, as well as some deleted scenes with an introduction by that filmmaker. Lee also gives more background in his feature film commentary, joined by cinematographer Ernest Dickerson, editor Barry Alexander Brown and costume designer Ruth Carter.